On the joyous occasion of Eid ul Fitar, following the tradition of Du’aat Mutlaqeen, Syedna Taher Fakhruddin TUS bestowed the Shehzadas of Syedna Qutbuddin RA with laqabs (honorifics). Syedna Fakhruddin related how he was given the laqab Fakhruddin when Syedna Qutbuddin anointed him as his successor on the 27th of Muharram 1437H – the Urus day of Syedi Fakhurddin Shaheed. Syedna attributed the bestowing of this honor to his predecessor Syedna Qutbuddin. 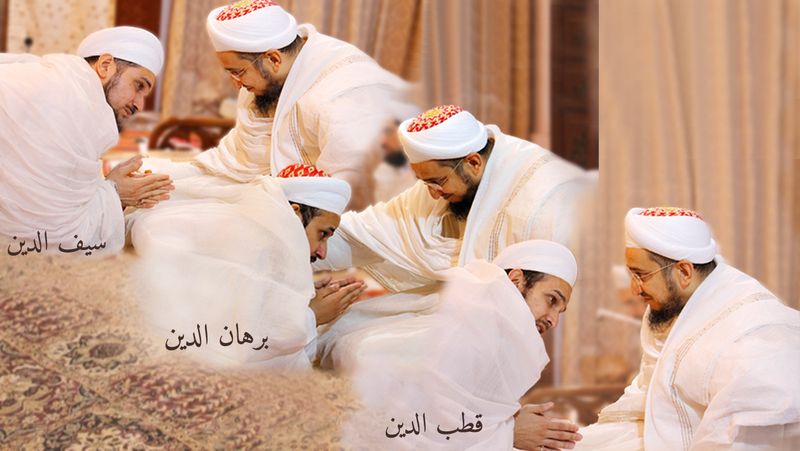 Garnering the barakat of Syedna Abdeali Saifuddin RA (43rd Dai) and Syedna Taher Saifuddin RA (51st Dai) – Syedna bestowed the laqab “Saifuddin” on Shehzada Dr AbdeAli Bhaisaheb Saifuddin. Garnering the barakat of Syedna Mohammed Burhanuddin RA (49th Dai) and Syedna Mohammed Burhanuddin RA (52nd Dai) – Syedna bestowed the laqab “Burhanuddin” on Shehzada Dr Husain Bhaisaheb Burhanuddin. Garnering the barakat of Syedna Qutubkhan Qutbuddin Shaheed (32nd Dai) and Syedna Khuzaima Qutbuddin RA (53rd Dai) – Syedna bestowed the laqab “Qutbuddin” on Shehzada Dr Aziz Bhaisaheb Qutbuddin. See the excerpt from Syedna Taher Saifuddin’s risalat in which he reports the bestowment of the laqab Qutbuddin on Syedna Khuzaima Qutbuddin on the Evidence of Nass page.